When Goliath corporations dominate a market, how can the Davids fight back? This Barrington-area physicians group is betting on a strategic alignment with like-minded players. 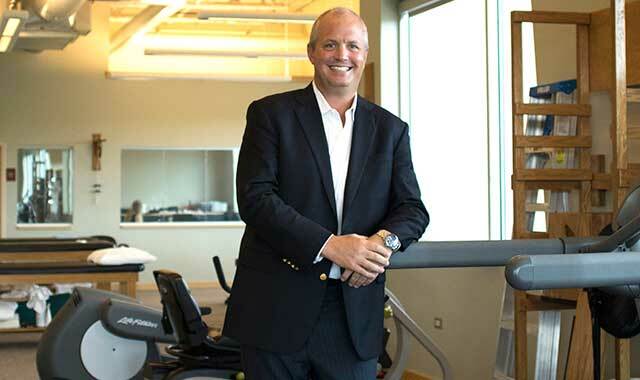 Dr. Gregory Brebach, principal and spine surgeon at Lake Cook Orthopedic Associates, and his fellow physicians work out of a therapy center in Lake Barrington’s Canlan Sportsplex and a main clinic on Illinois Route 22 in Barrington. Increased complexity and consolidation in the health care industry are dramatically impacting the way smaller, independent practitioners do business. In order to respond to pressure from government regulation, gargantuan corporate interests and goliath competitors, locally owned practices are being forced to fundamentally change their business models in order to survive. This dog-eat-dog marketplace has encouraged some creative thinking at Lake Cook Orthopedic Associates (LCOA), in Barrington. Soon, Brebach and his partner physicians will be able to focus more time and attention on their patients, trusting the tricky business side to experienced experts. Late this summer, LCOA announced it was merging with Illinois Bone & Joint Institute (IBJI), a collective of physicians scattered around northwest Chicago, North Shore suburbs and northwestern suburbs, including Arlington Heights. IBJI is a physician-owned practice that’s served the Chicago area since 1990 and currently specializes in every orthopedic specialty. The deal with LCOA is its 10th such merger. Once completed, the deal will join together more than 100 physicians at 22 locations. The merger is expected to help LCOA to continue delivering its high-quality health care at an affordable price, says Brebach. From a patient’s perspective, little should change. Operating as a “division of” the Illinois Bone & Joint Institute, LCOA will continue to operate with a degree of autonomy, something Brebach says was essential in preparing the practice for the future, and something he didn’t see from other potential suitors. One quality that’s distinguished LCOA since it was founded in the early 1980s is its hometown approach to quality medicine. Founder Dr. Frederick Locher started the practice at a time when agriculture was prevalent in Barrington and traumatic injuries, related to farming, were commonplace. But as the community has evolved, so has the practice’s expertise. The independent group of nine physicians specializes in orthopedic surgery and rehabilitation in areas such as sports medicine, diagnostic imaging, physical therapy, joint replacement, and treatment of injuries to the shoulders, elbows, wrists, hands, joints and spines. These physicians bring experiences in prestigious locales like Northwestern University, Vanderbilt University, Rush University, Loyola University and Cleveland Clinic. In addition to diagnostic tools such as X-ray and MRI, the practice maintains a staff of physical therapists who work at the Canlan Sportsplex, in Lake Barrington. Maintaining its hometown approach to medicine, LCOA also remains tightly knit with the Barrington community. Six physicians live in town. Several, like Brebach, grew up here. The remaining physicians live nearby, in places like Hawthorn Woods and Deer Park. Each gives back to their hometown in some way. Recently, LCOA donated 4 acres of conservation land surrounding its main office on Illinois Route 22. The property straddling Flint Creek is home to a variety of wildlife and numerous young oak trees. The nonprofit Citizens for Conservation will maintain the land as part of its nearly 150-acre Flint Creek Savanna preserve. Through the new relationship with IBJI, Brebach looks forward to diving deeper into the community and finding new ways to serve the region. In particular, he’s looking for opportunities to better serve patients who live in McHenry County. By some time in 2017, he expects to open a new location in the eastern part of the county. Closer to its home base, LCOA is upgrading technology and adding a new MRI machine that promises improved diagnostics. The physical therapy room at the Sportsplex is also getting an upgrade, with a new rehab room expected to open late this year. Brebach is focused on retaining a competitive edge at LCOA, and wresting market share from his much-larger competitors. Brebach emphasizes that the merger shouldn’t affect the patient experience. He looks forward to investing more time with patients, doing the work that first led him into practice. This entry was posted on Monday, October 10th, 2016 at 11:58 am	and is filed under Northwest Business Magazine. You can follow any responses to this entry through the RSS 2.0 feed. Both comments and pings are currently closed.